Some Stocktonians have waited through decades of fights, busts and disappointment hoping to see the city’s downtown injected with new life. So it was fitting that an ambitious proposal won its first City Council approval only after an interminable, contentious and completely unrelated public comment period. But the fracas over an appointment to a city commission was well worth the time for those remaining in the council chambers. A unanimous 7-0 vote gives the city 365 days to negotiate the potential sale of eight downtown properties to Ten Space*, a Stockton-based urban development firm that wants to transform 15 blocks of the city’s historic core into a mix of market-rate housing, retail and business space. The footprint of the proposed master-planned Open Windows project stretches between Miner Avenue, Main Street, Sutter Street and Aurora Street. The council’s decision does not commit the city to a sale, but during the one-year period, no other developer or individual will be able to legally angle for the city-owned land, which comprises three parking authority lots, two vacant parcels, and a trio of vacant and dilapidated hotels. The properties, along with numerous lots already owned by Ten Space within the project area, would give the company the critical mass to dramatically reshape the eastern half of Downtown Stockton. 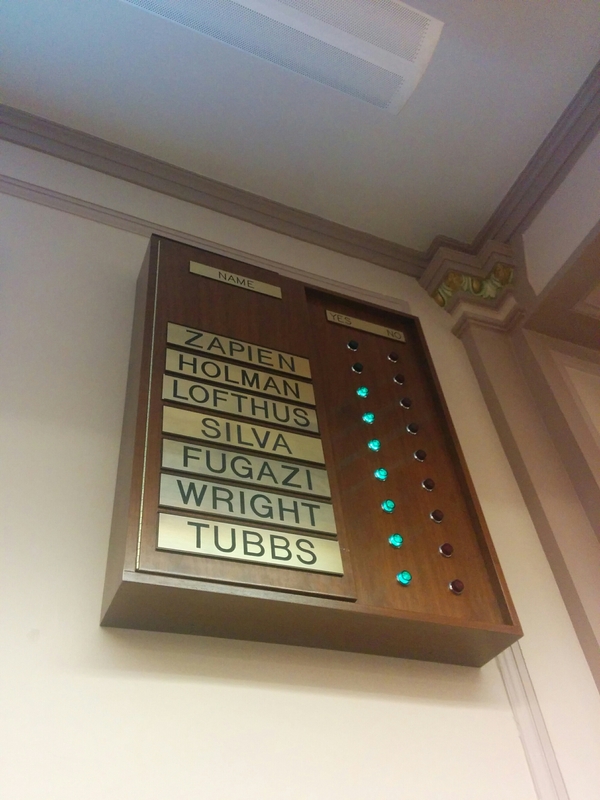 Though Tuesday’s vote is only a small step in what will likely be a lengthy process, backers of revitalizing downtown were so jubilant following the vote that the council chamber doors had to be closed as Ten Space owner Zac Court was congratulated in the antechamber. The supporters were equally vocal when they addressed the City Council immediately prior to its vote. Several residents echoed the idea that Open Windows could be a legacy project for the city, and pleaded with the council and city staff to either give the disused land and buildings away for free or dramatically cut development fees to help make the project a success. Steve Castellanos, a self-described homegrown Stocktonian and downtown supporter who owns an architecture firm with his wife, Linda Derivi, said the problems with the city center are widely known, but workable solutions have often been lacking. Cindi Fargo, CEO of the Downtown Stockton Alliance, was one of several speakers who cited Cort’s deep ties to the community as a native Stocktonian and his company’s experience with urban renewal as reasons that Open Windows might succeed where other downtown proposals have failed. Praise also came from the council dais. District 2 Councilman Dan Wright, who raced to second the motion to approve the negotiating window, said this was an opportunity the city can’t afford to miss, likening its potential to that of the River Walk in downtown San Antonio, Texas, widely considered a jewel of city center development. It’s now up to city staff and the people of Ten Space to reach a price agreement for the eight pieces of land and move this downtown dream one step closer to reality. As this project gradually solidifies down the road, definitely the city, Ten Space and DSA should use it for marketing and leveraging Stockton’s new ID branding image and sprouting renaissance to draw other development interests into downtown, say SF-based architectural developers, Mithun ( mithun.com ), or SoCal’s The Irvine Company investors/developers expanding into SF/Silcon Valley/NoCal ( http://news.theregistrysf.com/irvine-co-plans-bay-area-expansion/ ), and perhaps designate certain districts open for design and development competitions, say the west-end channel, north channel, and/or the creation of an “Official Civic Center Mall” that would consolidate all the municipal amenities into one central location for convenient public access.